Today's root beer comes from way back. 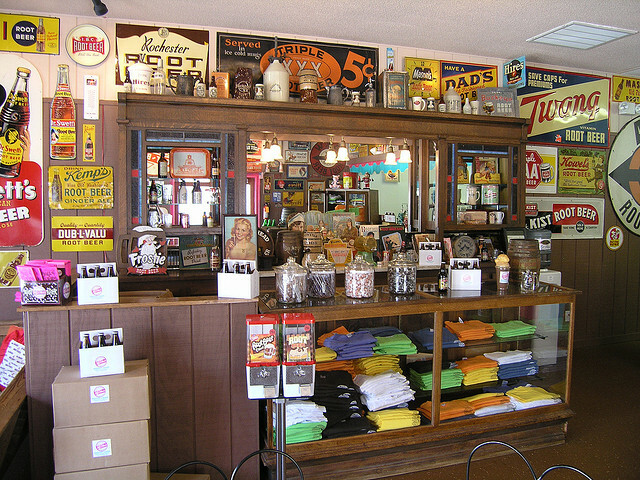 Frostop was a line of popular drive-ins back in the 1950s, but the root beer itself was actually first made and sold back in 1926 in Springfield, OH. The website has a little more detail about the history in case you're interested. My brother in Salt Lake City actually just text me to see if i had this one, but i had already found and ordered it from the Sodapop Warehouse. 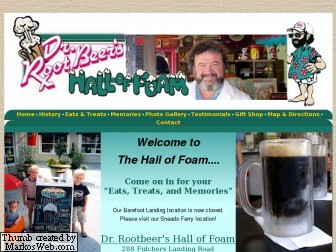 It's a decent site with lots of root beers for order. This isn't the most ideal way to get root beers because after buying them individually and having them shipped, it can get pretty expensive. That's why it's not really worth it unless you order about 12 or so at a time. The nice thing about it is that you can get one of each and can mix and match that way. Availability for root beers is sometimes quite limiting for those of us trying to give the general public a professional overview of what's out there. Looking at the Frostop site a little more, it looks like this stuff is pretty popular in the Midwest but can still be found scattered around the U.S. Just nowhere near me. This root beer came in a 12 oz. dark brown glass bottle, but it is also available in a 1-liter plastic bottle in various locations. The label has a fancy drive-in pictured with the logo proudly plastered across the bottom of it with the tag line "nothing tops it... but the foam!" It even has a little label around the neck that says this stuff is top rated. They take themselves quite seriously and almost dare you to try and not like them. No humblebrag here... just brag. Well i'd like to say i can refute all the good things this root beer has to say about itself, but alas i cannot. It's good. It's really good. It is really rich and creamy and has a great aftertaste. It's also sweetened with cane sugar and has good carbonation. I have to say, this is one of the better ones i have had lately. Hopefully it's more widely available than i have previously found it to be because i don't want to have to keep ordering this stuff online. For how good it really is, that could get expensive. My official review is that Frostop gets 8 (eight) IBCs. I really don't know why i even bother mentioning this since no one cares, but i let my wife weigh in on this one and she was surprised i rated it so highly. She said its good, but she didn't think it was that good. Truthfully, i was debating giving it a 9. But i think i made the right decision by leaning the direction of my wife. It's good, but not a 9 good. However, i think it is definitely deserving of an 8. I liked this one quite a bit. Give it a shot because i think you'll like it too. I know i took entirely too long to post this "second half" of the Chek root beer line of beverages, and for that i apologize. I also apologize that this will be an extremely short post, but really, there isn't much to add. Please see my Chek Root Beer review from earlier this month for the basics on the company and background and everything. This was picked up on the same trip at the same time as when i got the Chek 2 liter bottle at a Winn Dixie grocery store in Montgomery, AL. The label is basically an exact copy of the Chek label with a slight change in the color scheme. But what you really need to know is how it tastes. This one doesn't taste as good as regular Chek, which is kinda disappointing. I had higher hopes for this one, but it doesn't live up. I guess the old fashioned formula lacks that new zip. It has a good enough root beer flavor, but it tastes really watered down and loses its flavor fast. I have tasted dozens of root beers like this one, so it really has no appeal or originality to it either. My official review is that Check Old Style Root Beer gets 4 (four) IBCs. Like i said, i was kinda disappointed with the way this turned out. Being a generic store brand, i didn't expect much from it. But given the option of Chek and Chek Old Style, had i found them side by side at the store and never tasted either but only wanted to buy one, sadly i think i would go for the old fashioned simply because there is an implied notion that its better. Why else would they call it old fashioned? Certainly not to let you know it's not as good. Maybe it's because it was made in a bath tub. But anyway, my due diligence on this brand is done. If you're going to go generic and have to choose between the two Cheks, go ahead and skip the old fashioned blend. Ok, so i have more generics in my fridge, and i want to get these next couple out of the way cuz they are taking up space. This is the generic brand sold by the grocery store chain Winn Dixie. I picked this one up on my latest cross country tour with Richard in Montgomery, AL. They actually have two types of root beer (stay tuned for a review of the next one, coming soon) as well as several other flavors, which is typical of most generic brands. I am not sure where Winn Dixies are most prominantly located as far as the geography of the U.S. is concerned, but i do know they made movie called Because of Winn Dixie about a dog (i believe the dog in the movie was specifically named after the store). I never saw it, but i think it's supposed to be a feel good family film or something. And it has Jeff Daniels in it. And Dave Matthews? Weird. I probably still won't see it though. If i didn't review root beers, i would probably try my hand at reviewing movies (and be amazing at it), but i hear the major downside to that is that you have to sit through movies like that one. So i'll stick to root beers, cuz even if it's bad, at least i don't have to drink it for an hour and a half. These were cheapest in 2 liter bottles, so that's what i got. The generic theme is preciscely followed with the label on this brand. Just look at the color scheme, font, bubbles, etc. If you've been reading my posts at all, you'll recognize the trend. So needless to say, the label doesn't add much to the appeal. For those of you with super sharp eagle eyes, you can probably notice that the pic above is slightly altered. It's because i opened this bottle and poured a glass before i had taken a picture of it, so when i realized my error i just superimposed the label onto another picture of a full, unopened bottle. Not my best work, but it doesn't really matter. It's just a generic. I almost feel bad reviewing generics, because i don't have much to say about them. This one is a prime example of that. I still feel like i need to do my due diligence though and let you, my loyal readers, know which root beers are worthwhile and which you can skip. So for this generic all i can really say is that it's not bad, but not great. Has a good root beer flavor, but nothing to write home about. Decent carbonation, sweetened with HFCS, and is sold as cheap as they come. Definitely has value and is one of the better generics i've had, but really nothing special. Safeway's brand (Parker's Root Beer) is still my favorite generic i think, but this one is acceptable. Looking back at some of my generics reviews, i have given several a fairly high rating, which kind of suprises me. Most probably don't deserve it, but since i don't do re-reviews the rating will have to be allowed to stand. My official review is that Chek Root Beer gets 6 (six) IBCs. I was on the edge of giving it a 5, but it's really not terrible. There are definitely worse, more watery tasting generics out there. This one is better than a lot of them, but still nothing super special at all. The next variation of the Chek root beer formula will be reviewed soon, so we will see how they stack up against one another. Don't expect a lot of added content from that review though. I've covered most of the basics in this review.